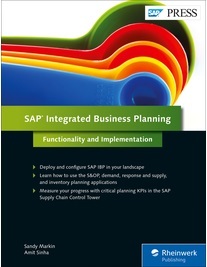 The new book about SAP Integrated Business Planning (IBP) by Sandy Markin and Amit Sinha is now available! Master SAP Integrated Business Planning processes and configuration and take your supply chain to the cloud! Begin with the basics, from loading data into SAP IBP to exploring the planning model. Then dive deep into key functionality and implementation steps for S&OP, demand planning, supply and response planning, inventory management, and supply chain analytics. Using industry case studies, you’ll discover what it takes to ensure successful adoption of SAP IBP. Available in E-book and Print editions. Previous Need ROI for your S/4 HANA project?